The St. Gallen Textile Museum is honoured to be able to display on its premises the 1st Triennial European Quilt Exhibition, which has been organised by the Max Berk Textile Museum in Heidelberg-Ziegelhausen. 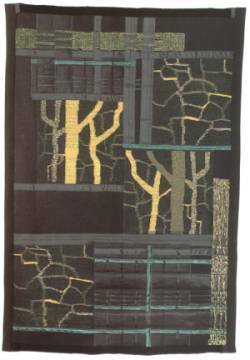 The precursors of this triennial event were the regular biennials on the same topic initiated in 1984 by Doris Winter, who is herself an artist working in quilts. At that time, participation in those adjudicated exhibitions was reserved for people originating from a German-speaking country; now, the event is open to artists from all over Europe. For the 1st Triennial European Quilt Exhibition, 457 works from 27 countries were submitted for adjudication. A small number of these, namely 46 quilts from 14 countries, satisfied the requirements of the jury, i.e. to demonstrate an innovative handling of the traditional theme of the patchwork quilt, in which various plies of material are sown together. 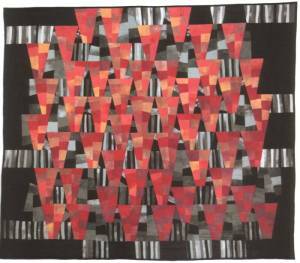 In today's quilts, textile artists frequently no longer use traditional cotton fabrics as basic materials; instead, they work with layers of plastic, synthetic mesh, padded tulle and even with technical fabrics. In addition, these textiles are modifid by dyeing, bleaching and painting, as well as by screen, transfer and computer printing. On the occasion of the 1st Triennial European Quilt Exhibition, three prizes were awarded for the first time. The first prize went to Charlotte Yde from Denmark for "Personalities" a work in four parts which consists of four narrow panels with a clear, recurring formal language. The geometrical shapes of the square, rectangle, point and line are employed as artistic elements in consistent graphical expression. 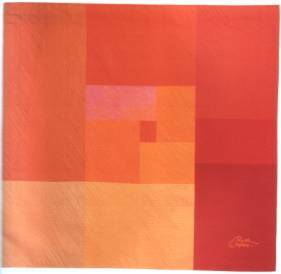 For this purpose, fabrics are cut, layered and etched. The four elements can stand for the four human humours. i.e. for the sanguine, phlegmatic, melancholic and choleric temperaments. 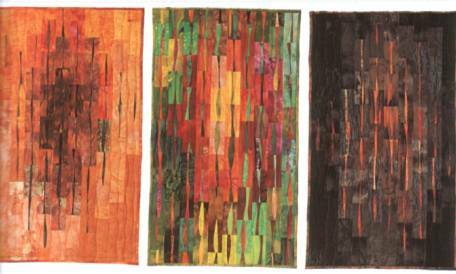 Now, the 1st Triennial European Quilt Exhibition is being hosted by St.Gallen. Its other previous venues after Heidelberg-Ziegelhausen were Zons-Neuss and Burgrieden-Rot in Germany. The exhibition is accompanied by a comprehensive catalogue.